For more than 500 years the Roman Empire ruled a great portion of the known ancient world, and it left its mark on the economics, arts and culture of Europe for centuries thereafter. In minting and monetary policy as well, the Romans laid the foundation for many subsequent developments. Römische Republik. Brutus. Denar, 42 v. Chr. The oldest Roman coins were cast in bronze (“heavy money” / Aes grave) and bore value symbols based on the as (= 1 pfund) and the unze (= 1/12 as) (e.g., the quadrans: 3 kugel = 3 unze = 1/4 as). These coins, however, proved extremely unwieldy and impractical. 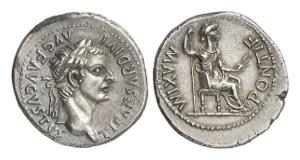 The denarius, as the principal Roman silver coin, was minted beginning in 211 BC with a value of 10 (later 16) asses. These Roman coins originally displayed the helmeted head of Roma on the front and the mounted “dioscuri” pair Castor and Pollux with the lettering ROMA on the reverse. In the course of the 2nd century BC moneyers (Tresviri monetales) were granted the right to place their names on the imprints of the Roman coins and to select the coin images themselves. It was not unusual for motifs to be chosen relating to glorious deeds of the moneyers’ own ancestors. These “family coins”, with a great number of mythological and historical depictions, represent an extremely fascinating and multifaceted collection area – above all, when such famous names as SVLLA or BRVTVS are to be found upon them. In 44 BC, Gaius Julius Caesar became the first Roman to receive from the Senate the right to have his portrait placed upon Roman coins during his lifetime, a right of which he made frequent use. His allies and competitors Pompey, Brutus und Antony appeared as well – after his murder – in the images on Roman coins. Römische Kaiserzeit. Tiberius, 14-37. Denar, Lugdunum. So genannter „Tribute penny“. With the end of the Republic and the beginning of rule by Emperors one finds, normally, the respective emperors and their families (consorts, heirs to the throne and co-regents) represented on the coins. The monetary system continues to be “tri-metallic”, based on gold-, silver- and bronze coins. The inscriptions feature the honorifics and offices of the respective emperors, with the year, and to that extent are easily dated (e.g., COS V = Minted in the Year of the 5th Awarding of the Title Consul / + “iteration figure”). Due to the great number of different types, denominations and mints, and the relatively user-friendly literature, the collection area Roman Coins actually opens, even to the beginner, an array of exciting collection options. Another significant aspect for the collector is that the coins of the Roman Imperial Period were used not only a means of payment, but also as a mass medium. They may be said to have been, in a way, the “metallic newspapers” of the empire, upon which the deeds and military successes of the emperors were committed to eternity. 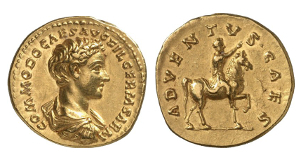 In the late Imperial Period the value and the precious metal content of Roman coins went into a steady decline. Emperors including Diocletian (284-304) and Constantine the Great (308-337) attempted to counter this trend with currency reform and the introduction of new denominations, such as the bronze follis and the gold solidus. Ultimately neither the demise of the currency, nor that of the empire, could be stopped and, with Romulus Augustulus (475-476), the last emperor of the Western Roman Empire appeared upon Roman coins -- before he was deposed by the Germanic officer Odoacer. Immerse yourself in the Punic Wars, Caesar’s conquest of Gaul, or the burning of Rome under the Emperor Nero, and experience ancient Rome in coin images! In Roman coins one does not collect simply coins, but also historical events. Albert, R.: Die Münzen der römischen Republik von den Anfängen bis zur Schlacht von Actium, 2. Auflage, Regenstauf 2011. Kampmann, U.: Die Münzen der römischen Kaiserzeit, 2. Auflage, Regenstauf 2011. Kampmann, U. / Ganschow, T.: Die Münzen der römischen Münzstätte Alexandria, 1. Auflage, Regenstauf 2008. Magnentius, 350-353. Æ-Doppelmaiorina (Follis), 353, Ambianum; 8.89 g. RIC 34. Nepotianus, 351. Æ-Maiorina, Rom, 4. Offizin; 5.06 g. RIC 200. Lucius Verus, 161-169. Ô-Aureus, 167, Rom; 7.32 g. RIC 568; BMC 446; Coh. 52; Calicó 2128. Theodosius I., 379-395. Ô-Solidus, 379/383, Treveri; 4.48 g. RIC 50.